Mr. Faheem is the founder and CEO of Kinetrix. He has over 20 years of experience in Investment Banking, Asset Management and Private Equity focusing on strategy formulation, regulatory /compliance and risk management with some of the leading institutions in the world such as ADIA, Credit Suisse, UBS, Swicorp and Nomura. While working as a Management Consultant for Capco, Faheem worked on projects for clients such as Merrill Lynch, Deutsche Bank, ABN Amro, RBS. 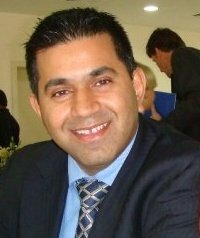 Faheem has developed a complete front to back perspective of business, understanding the key elements in building a robust, scalable and sustainable infrastructure based on good governance that would allow the organization to grow in a controlled and consistent manner whilst at the same time understanding the regulatory implications of doing so. Mr. Al-Mazroui joined Abu Dhabi Investment Authority (ADIA) in 1983 upon graduation from the University of California with a degree in Economics and is currently its Executive Director, and Head of the Evaluation & Follow-up Department. From 1989 to 1990 he served as Director of ADIA London Office where he managed ADIA's external portfolio and many other affairs including being deputized to H.H. The Crown Prince’s Court to serve as Director of General Services in 1990 and Director of Equities Department (Far East) for ADIA in 1993. Mr. Al-Mazroui has over 25 years of extensive experience in all aspects of global capital markets, including investments sectors ranging from equities (public and private), to bonds, to alternative investments (including commodities, hedge funds and real estate). Mr. Al-Mazroui’s private business interests include Delma Brokerage, a financial services company, Arabian Real Estate Development, a real estate development company, Oasis Power International, energy & power related company, Tamas Projects, a specialized electro-mechanical & maintenance Co., Gulf Oil Field, a products & services for oil industry and Pharma Lines, a regional pharmaceutical company. Antonio Rubel has been an owner and proprietor of several business ventures spanning a career of over 35 years. In 1978, he founded Interoffice Holding AG, an office furnishings, interior planning and turnkey projects consulting company, and built it into a company with approximately 230 staff, the strongest distribution network in Switzerland’s office sector with offices in Switzerland and international markets. In 2007 the company sales amounted to CHF 100 Million and in the same year was acquired by Lienhard Office Holding and Denz AG. Dr. Rubel remains the chairman for the new merged entity Lienhard Office Group. Rubel is also the owner and proprietor of Charterbay LLC an established name in marina boat and crew management, marina development, yacht brokerage and luxury cruises with operations based in Italy, Spain, Dubai and Abu Dhabi. Rubel started his career in 1968 working for Solvay Pharmaceuticals as the their Export Manager and an investment analyst at Merrill Lynch. Rubel holds a BA Hons degree in Business from London Business School and later completed his PhD from London School of Economics.